Lee Woolery|Miami Valley Today Troy senior David McGraw works to turn Piqua’s Isaac Bushnell during a Senior Night match Wednesday night at Troy High School. Lee Woolery|Miami Valley Today Troy’s Carlos Quintero takes down Xenia’s Evan Brown Wednesday night. Lee Woolery|Miami Valley Today Troy’s Logan Wilson maintains control over Piqua’s Beth Herndon Wednesday night. 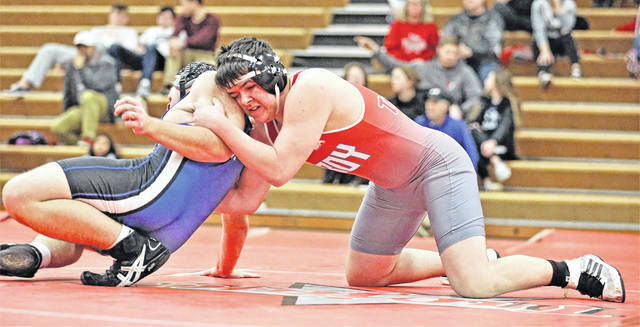 Lee Woolery|Miami Valley Today Troy’s Noah Leach grapples with Xenia’s Gabe Wilson Wednesday night. 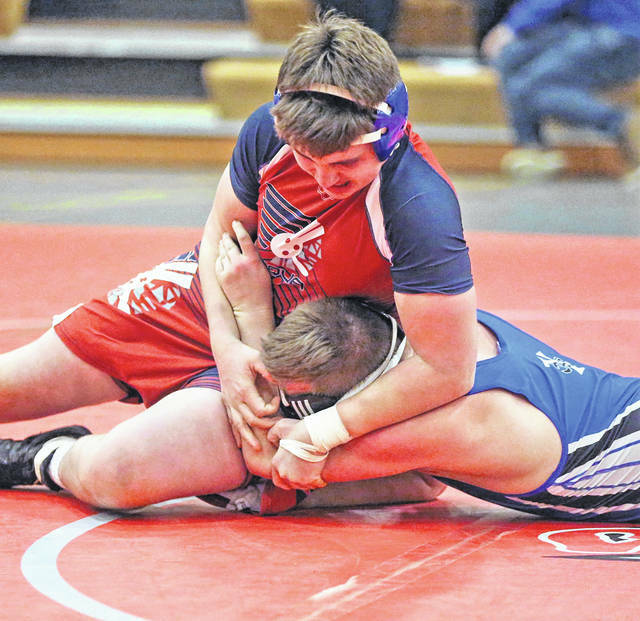 Lee Woolery|Miami Valley Today Piqua’s Bryce Short maintains control of Xenia’s Jacob Stickle Wednesday night. Lee Woolery|Miami Valley Today Troy’s Colin Burns pins Xenia’s Cory Davis during an exhibition match Wednesday night. Lee Woolery|Miami Valley Today Piqua’s Tyrese Mixon pins Xenia’s Cory Davis during an exhibition match Wednesday night. Lee Woolery|Miami Valley Today Troy’s Ethan Freed and Piqua’s Lance Reaves battle Wednesday night. TROY — With fellow senior Shane Shoop out of the lineup, Troy senior David McGraw knew that, if he wanted to see action on his Senior Night, he’d have to move up and face tougher competition. It didn’t phase him one bit. McGraw, bumping up from his normal 160-pound weight class to 170 for both of his matches in Wednesday’s tri against Piqua and Xenia, was dominant all night long, scoring a pair of pins as the Trojan wrestling team honored its two seniors in a 48-9 victory over the Indians and a 48-29 loss to the Buccaneers Wednesday night at Troy High School. McGraw, who was honored while standing with his mother Lisa before the match, pinned Piqua’s Isaac Bushnell with 14.5 seconds left in the first period during his first match, then he pinned Xenia’s Taylor Maxwell with 1:27 left in the second period of his final match. And that pin against Maxwell was an impressive one, too. Already winning 13-0 after the first period, McGraw chose to start out on top in the second, needing only two near-fall points to win a tech. fall. But when McGraw turned Maxwell, he flipped Maxwell directly into a pin, and the official wasted no time counting it down and giving McGraw the extra bonus point. “It felt good. That’s what I was really hoping for was a tech pin, because I wanted to be on the mat as long as possible — since it was my last time wrestling here at Troy,” McGraw said. “That’s why we bumped him — I wanted him to get a match. And he came out firing, too,” Troy coach Doug Curnes said of McGraw. “In the second match against Xenia, he was doing everything we’d coached him on this week. We just put in a new system for him that we saw benefited him. We practiced it a couple days, and he did everything scripted by the book. 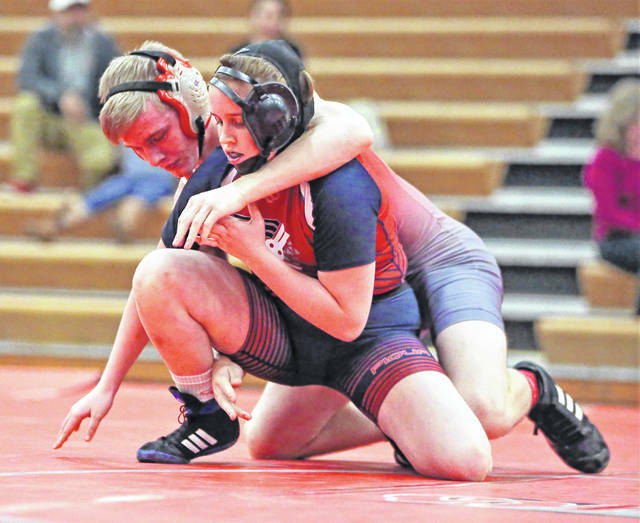 Against Piqua, there were only two other matches that counted towards the team score, as Logan Wilson (138) pinned Piqua’s Beth Herndon with 40.8 seconds left in the first period, then the Indians’ Lance Reaves (285) scored a 4-1 decision over Troy’s Ethan Freed. 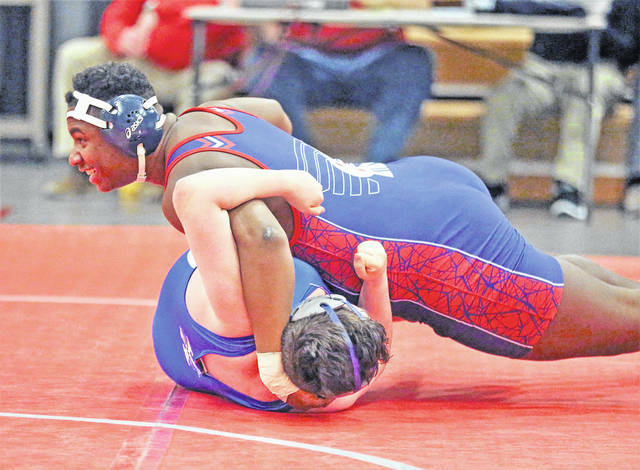 Piqua gave up six forfeits in the dual, while Troy gave up one. Xenia then began its night with a 63-0 victory over Piqua, picking up seven forfeits and winning all four matches wrestled. Desmond Diggs (138) won a 16-0 tech. fall over Herndon, Taylor Maxwell (170) pinned Bushnell with 1:16 left in the second period, Jacob Stickle (220) pinned Bryce Short with 58.3 seconds left in the first period and Peyton Bartley (285) won a 16-6 major decision over Reaves. The Bucs took an early lead over Troy, too, picking up forfeits at 120 and 126 and then with Diggs (132) pinning Nic Matthews with 19.2 seconds left in the first period. Troy scored a forfeit at 124 to get on the board, but a pin by Phillip Nared (145) over Gabe Cusick and a pin by Jhett Peck (152) over Joe Cusick gave Xenia a 30-6 lead. Troy closed the gap, though. Carlos Quintero (160) got things going by scoring an 18-2 tech. fall over Evan Brown, then McGraw stuck his second pin of the night and Noah Leach (182) stuck a pin with 59.7 seconds left in the second period to get the Trojans to within seven points at 30-23. But Xenia responded, as Stickle (195) pinned Cheyanne Meade with 1:30 left in the first period, the Bucs picked up a forfeit at 220 and Bartley (285) pinned Freed with 1:43 left in the second period to make the score 48-23, with the Trojans picking up one last forfeit at 106 for the final margin. 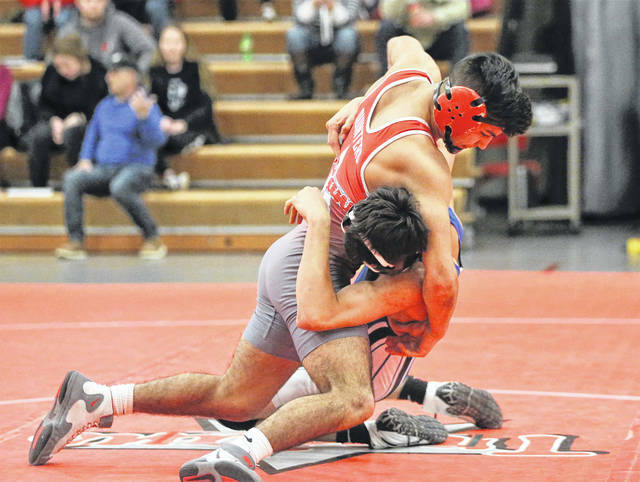 The night had originally just been a dual against Xenia for Troy, but after Saturday’s action was cancelled due to the snowstorm — the Trojans had been set to compete at the Miamisburg Invitational tournament — it left teams looking to add matches wherever they could. 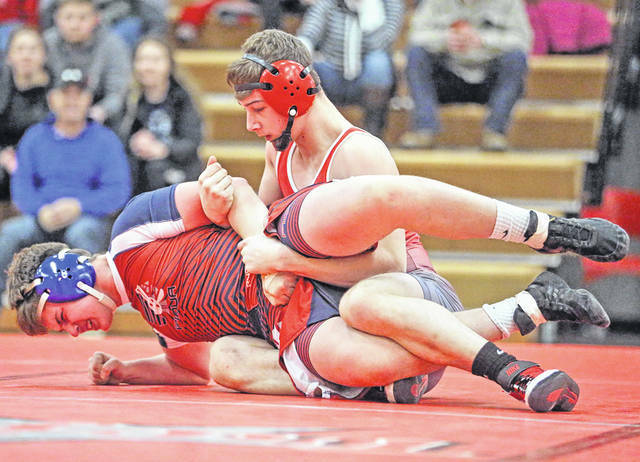 Troy picked up a double-dual for Thursday night, traveling to Stebbins to face Miamisburg and Indian Hill, then it has some time off before it travels to Northmont for a dual on Jan. 25. 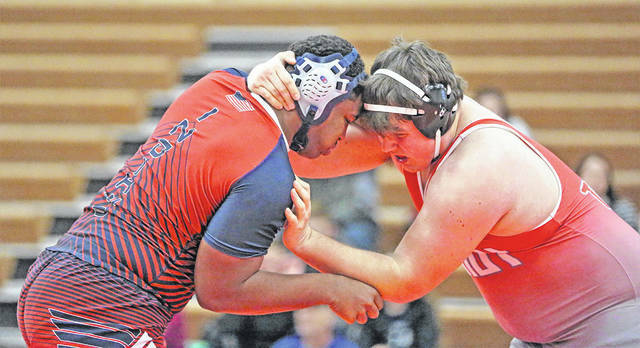 Piqua, meanwhile, competes at the Napoleon Duals Friday and Saturday. https://www.dailycall.com/wp-content/uploads/sites/30/2019/01/web1_011619lw_troy_mcgraw_piqua_bushnell-1.jpgLee Woolery|Miami Valley Today Troy senior David McGraw works to turn Piqua’s Isaac Bushnell during a Senior Night match Wednesday night at Troy High School. https://www.dailycall.com/wp-content/uploads/sites/30/2019/01/web1_011619lw_troy_carlosquintero-1.jpgLee Woolery|Miami Valley Today Troy’s Carlos Quintero takes down Xenia’s Evan Brown Wednesday night. https://www.dailycall.com/wp-content/uploads/sites/30/2019/01/web1_011619lw_troy_wilson_piqua_herndon-1.jpgLee Woolery|Miami Valley Today Troy’s Logan Wilson maintains control over Piqua’s Beth Herndon Wednesday night. https://www.dailycall.com/wp-content/uploads/sites/30/2019/01/web1_011619lw_troy_noahleach-1.jpgLee Woolery|Miami Valley Today Troy’s Noah Leach grapples with Xenia’s Gabe Wilson Wednesday night. https://www.dailycall.com/wp-content/uploads/sites/30/2019/01/web1_011619lw_piqua_bryceshort-1.jpgLee Woolery|Miami Valley Today Piqua’s Bryce Short maintains control of Xenia’s Jacob Stickle Wednesday night. https://www.dailycall.com/wp-content/uploads/sites/30/2019/01/web1_011619lw_troy_ethanburns-1.jpgLee Woolery|Miami Valley Today Troy’s Colin Burns pins Xenia’s Cory Davis during an exhibition match Wednesday night. 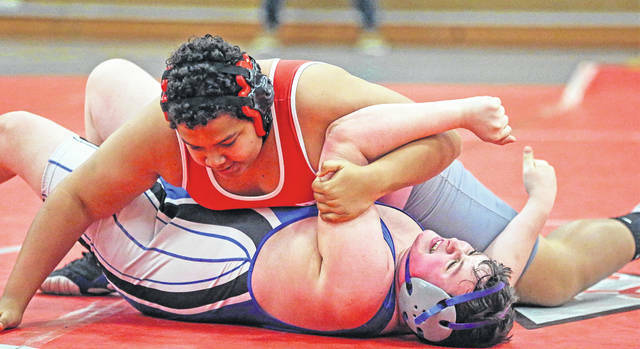 https://www.dailycall.com/wp-content/uploads/sites/30/2019/01/web1_011619lw_piqua_tyresemixon-1.jpgLee Woolery|Miami Valley Today Piqua’s Tyrese Mixon pins Xenia’s Cory Davis during an exhibition match Wednesday night. https://www.dailycall.com/wp-content/uploads/sites/30/2019/01/web1_011619lw_troy_freed_piqua_reaves-1.jpgLee Woolery|Miami Valley Today Troy’s Ethan Freed and Piqua’s Lance Reaves battle Wednesday night.